Step 6 invloves adding the electrical channel cover, filling the area between LWY and the lower longeron with foam, and cutting the sides to length. February 27, 2000. 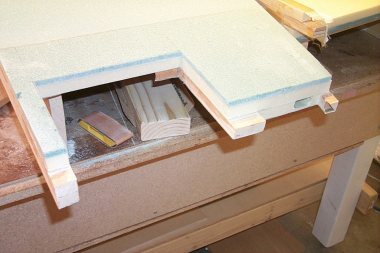 Here are the electrical channel cover forms all covered with box tape and taped into position on the workbench. February 27, 2000. 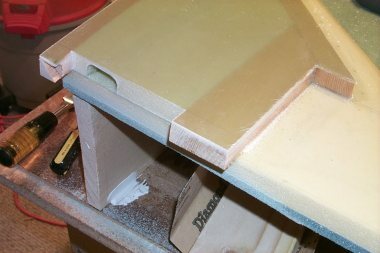 The cover forms after adding a ply of BID to each. February 29, 2000. 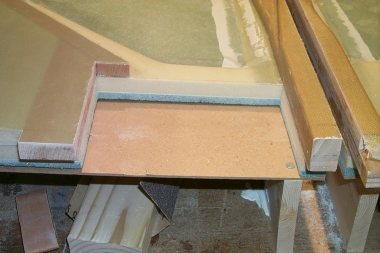 Here is the electrical channel cover glued into place. It was made 0.7" tall so it would be flush with the top of the wood around it. March 6, 2000. Here is the foam filling in the area between the lower longeron and LWX and LWY. The area was filled with two main pieces and a thin section over the top of the electrical channel cover. March 6, 2000. 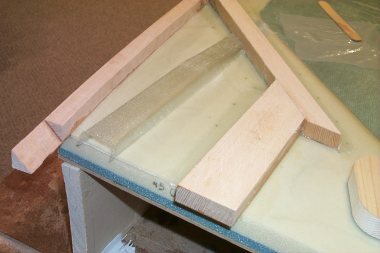 Here is the foam area after applying the six layers of BID. 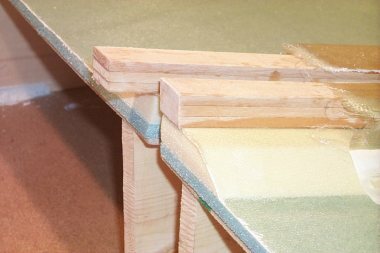 This was covered with peel ply. March 7, 2000. 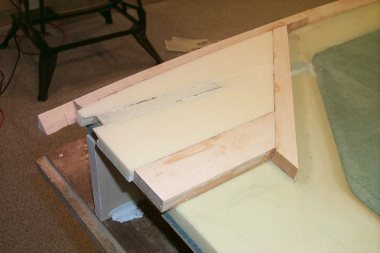 Here is the fuselage side jig after popping off the side. There are several small and one large divot. I only put back the large one. 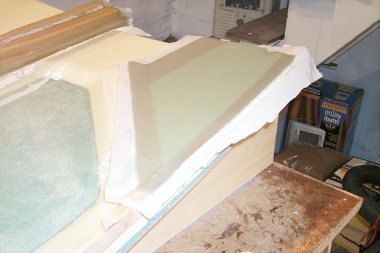 Most of the small ones are along the edges and will most likely get sanded away while shaping the fuselage later. The rest of the small dings will get filled later. March 8, 2000. 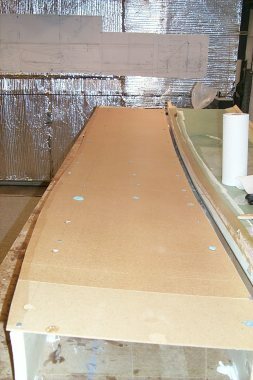 Here is the aft end cut to length. LWX and the lower longeron are about 3/4" longer than the rest of the side. These will get trimmed later to fit the firewall. March 8, 2000. Here is the upper longeron cut to length. It too is still a bit long. This will get trimmed later to match the firewall. March 8, 2000. 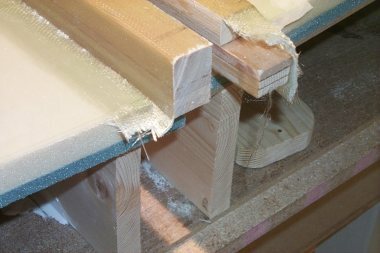 Here is the forward end cut to length. The 3/4" foam was a bit too short. If you look real hard you can tell the upper half of the 3/4" foam angles in a bit. This gets cut off for the canard later so it doesn't matter here. I have the same problem at the lower longeron but a sliver of foam or a glob of flox will fix this issue when attaching to F-22. March 8, 2000. Here is the spar cutout. The height is 8.7" inches. The width is around 5.5". I will wait until later to trim it as needed. March 8, 2000. Here is the aft end with the side flipped over. 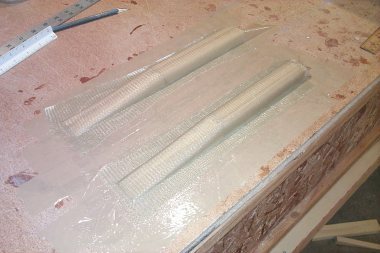 All the foam has been trimmed to length while the longerons and LWX extends an extra 1/2" - 3/4". The spar cutout is obvious. 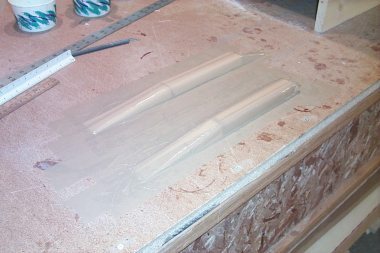 I will admit I was nervous cutting the fuselage ends and making the spar cutout. I spent a lot of time making these sides. It was weird putting saws, knives, and chisels to them. March 10, 2000. 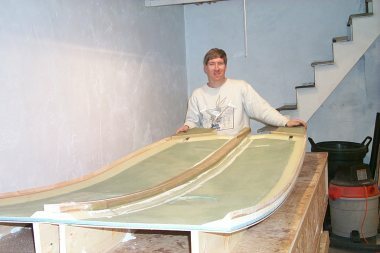 Here I am proudly presenting the completed fuselage sides.